Big Pine Creek North Fork Trail skills refresher trip, April 9-10, 2018. 14 miles, 4,113 ft.
After an interminable wait through the winter I finally make it out to play in the snow. My goals include practicing ice axe self-arrests and testing some new traction devices. Although I have been to the Big Pine Creek North Fork Trail area in snowshoe conditions before and would like to try another winter destination, I choose to return on the advice of the ranger because of the small distance from the trailhead to snow, and a particularly good safe slope with a safe run-out to practice self-arrests. The view from the Eastern Sierra Visitor Center looks promising. The ranger guesses that the snow will start around 9,000. ft and he is exactly correct. I have done the lake tour before but not climbed the pass. 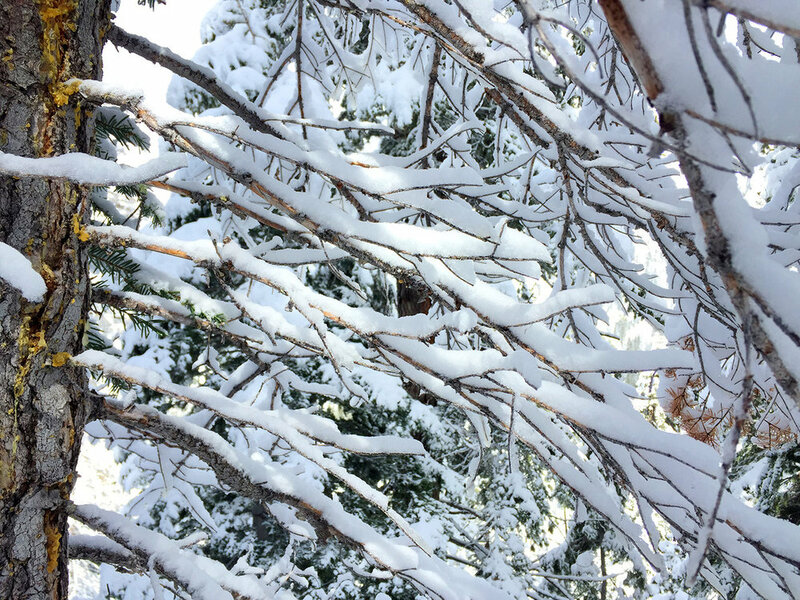 The Lon Chaney cabin sits around 9,00 ft where the snow begins and where I take a break on the porch and make up some miso soup. The cabin is in the rustic style and has had some recent work to the "pointing" of the mortar. Very rustic. I take a chance that the snow is sufficiently consolidated to not require snowshoes and so I leave them behind in the car. I am wearing some light ankle-high Solomon GTX boots with the some new lightweight Chainsen micro-spikes, and congratulate myself for my wise decision to leave my heavy snowshoes behind. I meet three dayhikers with snowshoes who are descending and who express to me that they are jealous that I will spend the night. First Lake is still frozen. On the way to Third Lake there are a few foot depressions that I follow, but no real postholing. Pretty much all obvious snow impressions disappear at Third Lake. I find a nice spot at Third Lake top settle in. There is no exposed ground for camping but there are some large rocks that I can sit on while relaxing. Third Lake shows some signs of melting. I settle in to read and listen to music, and enjoy the scenery sliding into dusk, activities which are all greatly enhanced by 3 oz of Glenlivet. I like to push the nighttime photographic capabilities of the iPhone. Morning arrives and it is time to attack the slopes. I bring three types of traction to test. 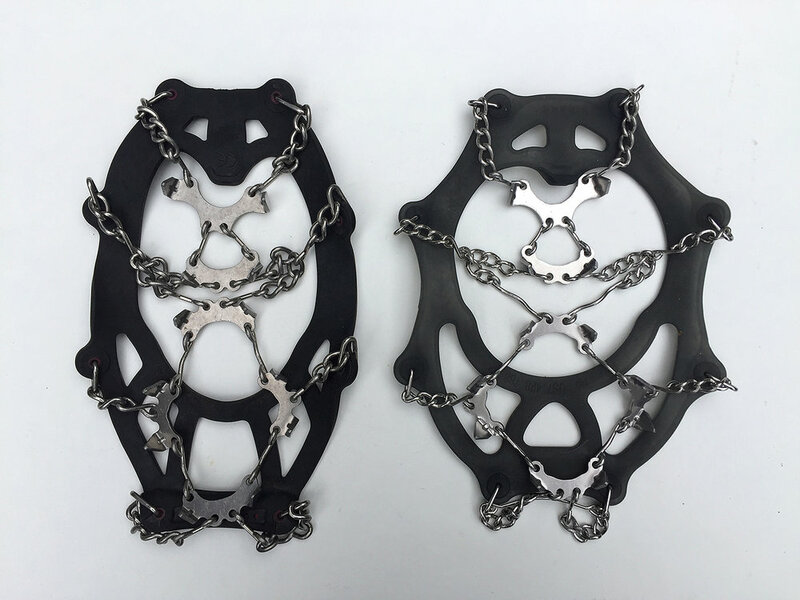 The other item I tested are the new Vargo Titanium Pocket Cleats, which weigh 4.4 oz. They are shown here incorrectly fitted, as I later figured out that I should put them on over the gaiter strap, not under. Nevertheless, they performed well on my icy trip to the slopes. I think they are a fantastic option for emergency traction or those just-in-case situations, shoulder-season trips, and through-hikers who will have to go over one or two sketchy trail passes. In more challenging slope conditions I definitely prefer the microspike-type traction over the Pocket Cleats, as spikes extend to the heel and are arrayed around the edges of the sole rather than being concentrated in the ball and arch of the foot. I do have a complaint when the outer threads of the Pocket Cleats begin to fray after only one hour of use. This is completely unacceptable and makes one wonder how much testing they underwent before release. The manufacturer could have easily partially mitigated this problem by having the folds turn inwards rather than out. I will have to reinforce these connections at home with nylon or even metal thread or some kind of metal staple. I see some very freakish snow formations are are the result of sun and wind. I cross the rock field from the trail off from Third Lake to the slopes that look perfect for my self-arrest practice. Once I arrive at the slopes I spend about 90 minutes sliding down the hill self-arresting with axe and crampons, feet first, headfirst, keeping crampons up in the air, using crampons to dig in, etc. I feel good about how it is going and decide to ascend Contact Pass. The last bit up Contact Pass is considerably steeper, with patches of harder ice, and where I have to work a lot harder to plunge the axe, and even front-point the crampons to climb. I am rewarded at the top of Contact Pass with a great rare view of the east side of the Palisades covered in snow. The descent is steep but I feel good about the snow and how well my crampons are gripping. I would be less enthusiastic with a micro-spike type traction, and very uncomfortable with the Pocket Cleats. However, lower down the hill I gain my real self-arrest education. For fun, I start doing some controlled slides, and I suddenly find myself traveling downhill quite a bit faster than I want, basically out of control, and I have to perform a real-life self-arrest. It is difficult, snow sprays all over the place, not at all pretty, even a bit violent. It leaves me with the impression that on a real fall I probably only have a 50/50 chance of saving myself with the axe. All in all, a fun and informative short trip. The next time I go out in early April, I might wear the snowshoes. 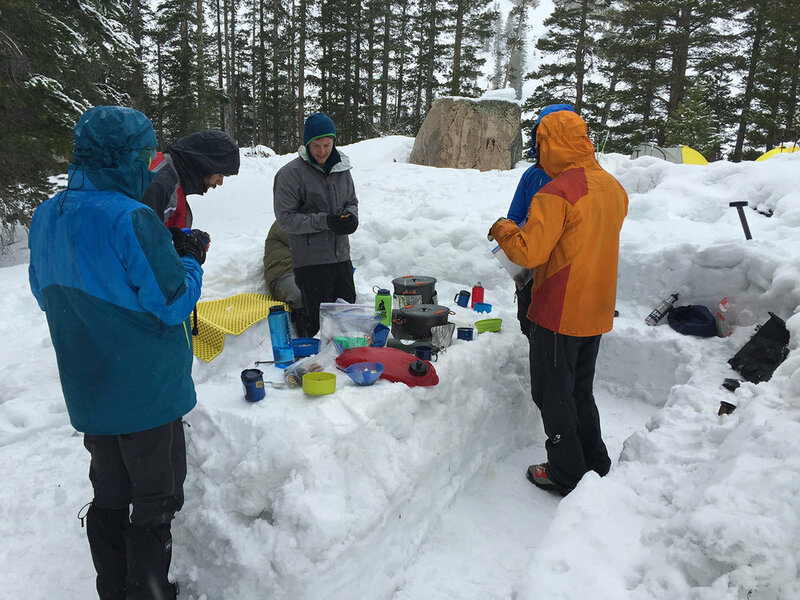 Winter mountaineering refresher course with California Alpine Guides up to Matterhorn Peak 2016. Base camp. It is cold and wet, with the ascent to Matterhorn Peak doubtful. 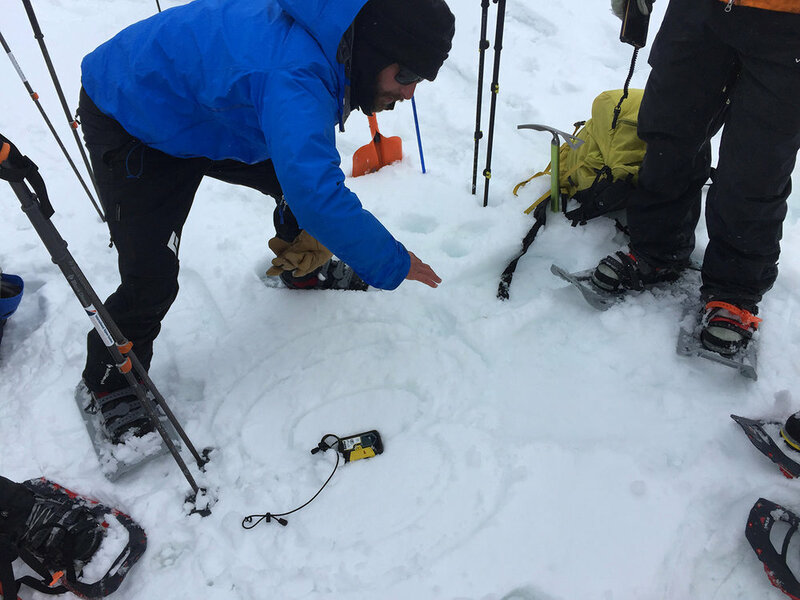 Jason goes over the technical aspects of avalanche transceivers. 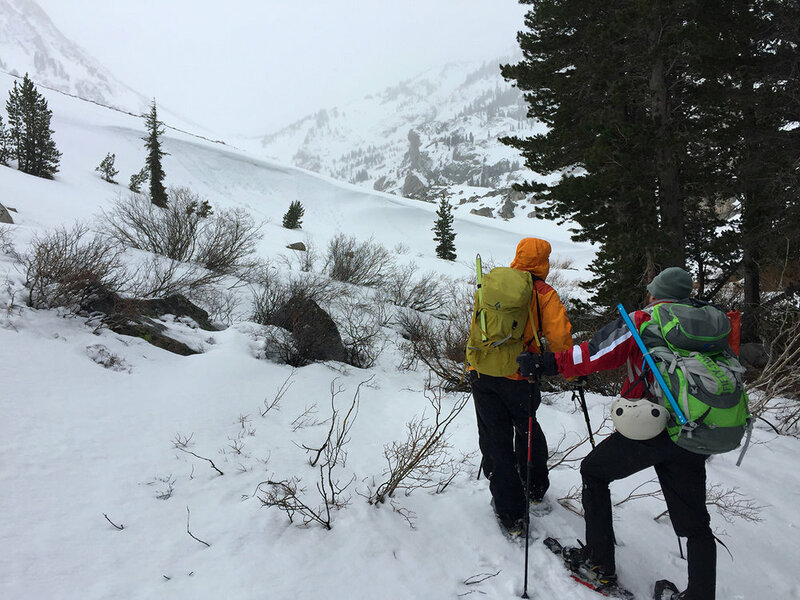 How to locate and probe for the hypothetical avalanche victim. 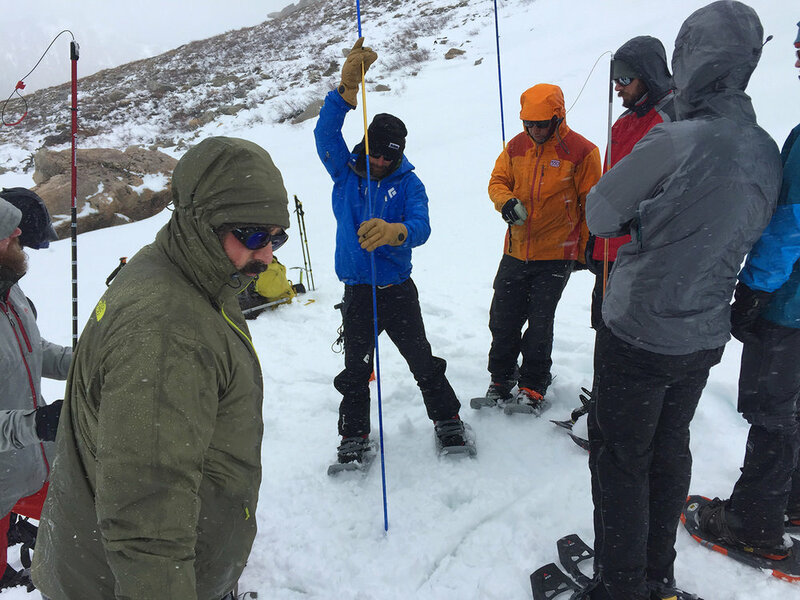 Team shoveling technique for hypothetical avalanche victim. At the speed we shoveled, she probably died, hypothetically. The temperature floats around 36, with wind and alternating snow and rain. Some people are cold, wet and miserable. The weather forecast is for a lot more snow that night, and then either a beautiful following day, or tons of more snow. A vote is taken: 3 in favor of bailing, 4 in favor of sticking it out. I passed around the Canadian Club. We have to shake off the snow a few times during the night. The view out the front door in the morning of the single-wall Black Diamond tent, which performed well. The next day is sunny and glorious, everyone is happy.